Eating better. It’s something I work at every day. Along the way, I’ve learned a few tricks that can make all the difference. You may be wondering what this picture has to do with making eating better, easier. 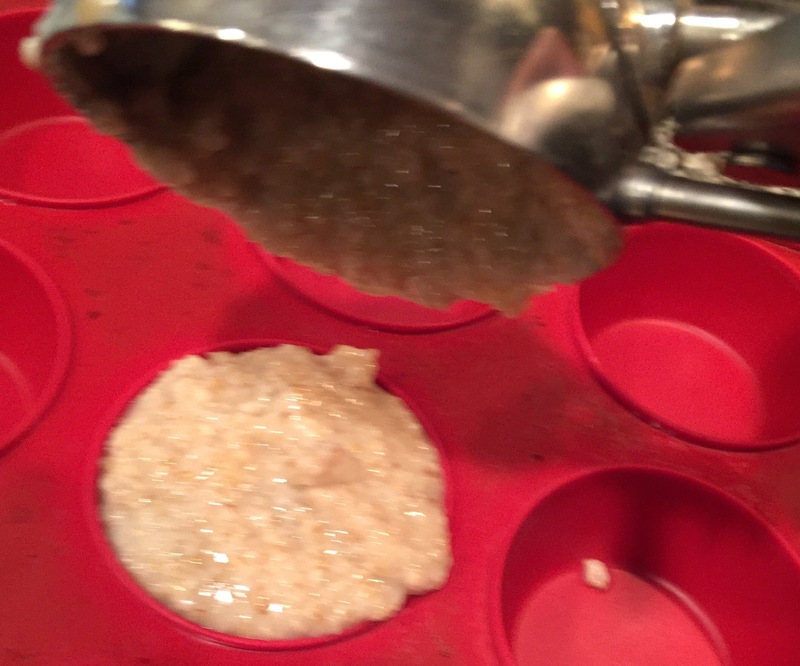 Well…that is a heaping half cup of freshly cooked steel cut oats being scooped into a silicone muffin pan. Why would I do that? And why would I take a picture of that? Well…cooking steel cut oats takes about 45 minutes. At my house morning doesn’t start 45 minutes before “breakfast and out the door” does. So I cook a big batch of steel cut oats as part of a “have time to cook” night and freeze them in ready to go portions. After a few hours in the freezer, they pop right out of the muffin pan and get stored in a gallon size zipper bag, ready for their turn for a quick 2 minute reheat. Add fresh berries and a splash of almond milk and ….tada….better breakfast made easier! Just an example of one of my 4 favorite ways to make eating better, easier. I don’t plan a day by day, meal by meal menu. What works for me is plan 4 entrees for the week (3 are tried and true favorites and 1 is a “gotta try that” new recipe.) There are 2 of us eating at my house, so I plan to make 6 servings of an entrée. That means we can have it for dinner once, enjoys some leftovers (or planned overs) for lunch once, and freeze 2 portions for dinner/lunch on some future busy day. In addition to the planned entrees, I have a few Desperation Dinners up my sleeve – things that I can throw together very quickly from pantry ingredients. 2. Buy what you want to eat and what you want your family to eat. Consider…not buying what you don’t want to eat. So simple to say, huh? I know that you may not share the same high eating standards with all of the people you share silverware with. But if you are the one with the planning and cooking responsibilities, you have the power! At least strive to make the bulk of what you buy consistent with your definition of eating better. 3. Cook ahead – the time to cook is when you have time and will enjoy it not when you’re hungry now. I love to cook but I can’t spent a lot of time doing it every day. If it is a “time to cook” night, while I am in the kitchen I’ll cook more than the planned entrée. I’ll likely cook some quinoa (done in just 15 minutes), throw some brown rice in the rice cooker (takes over an hour in my rice cooker), and start some beans in a mini crockpot (I cook them for 24 hrs on low.) Since I will also have a cutting board and Chef’s knife all warmed up, I will likely prepare a few vegetables for future meals. If I am slicing carrots for a soup, I’ll probably also cut a carrot or two into carrots sticks for lunch tomorrow. I’ll make a big fresh vegetable salad (more than we will eat that day.) I might have soup going on top of the stove and a casserole in the oven. While the oven is on, I might roast some vegetables. This makes it so easy to fill a lunch bag and when it is definitely NOT a “time to cook” night, I can quickly assemble a meal with little clean-up. 4. Packaging leftovers (or planned overs) in portion sized containers makes eating better really convenient. I know you are trying to avoid convenience foods but I am telling you if you make eating better really convenient you are lots more likely to succeed. Put the foods you worked hard to prepare where you will see them. I keep a tray right at eye level in the refrigerator. This tray is full of ready to eat portions of food that can be thrown into a lunch-bag or a backpack, reheated for a quick meal or eaten as is. If you will be using the food within the next 4 days you can safely store it in the refrigerator. Just be sure to know what day is day 4. Easiest way I know to do that is to just use day of the week stickers that you can buy at any office supply store. I find it works best to sticker the food with it’s use by or discard date rather than its preparation date. So that is all there is to it. Woops – I don’t want to make it sound easy. I only promised “easier.” I have spent most of my professional life helping people learn to eat better. It’s not easy. Changing the way you eat takes the same degree of skill as learning to play a musical instrument. You wouldn’t decide that tomorrow morning you will be a concert violinist (unless you already are one tonight) . Yet sometimes we do decide that tomorrow morning (or Monday morning) we will eat perfectly. We all know it takes years of dedication and practice to learn to play a musical instrument. It also takes dedication and practice (and doing dishes) to feed you and your family better. So…Define the ways you want to eat better and make a simple plan to begin to do it. Be sure your buying is in sync and cook and package with tomorrow in mind. As you do these 4 steps you will find eating better getting easier – I promise! How do you make eating better easier? I’d love to hear.